Cable theft is a serious problem and the Metro network, which owns and manages the system, has spent vast sums of money carrying out repairs as a result of cable theft. Nexus is already working with railway industry partners, utility companies and the police to press for changes in the laws and regulations that cover the trade in scrap metal, so it is harder for thieves to sell stolen cables as scrap. Seven years ago Nexus, which owns and manages the Metro system in the North East, joined forces with North Tyneside Council and Northumbria Police to launch a hard-hitting poster campaign to warn of the dangers and consequences of cable theft from Metro lines. Now today seven years on the award wining campaign, which was designed by, Guerilla can still be seen across the North East of England. 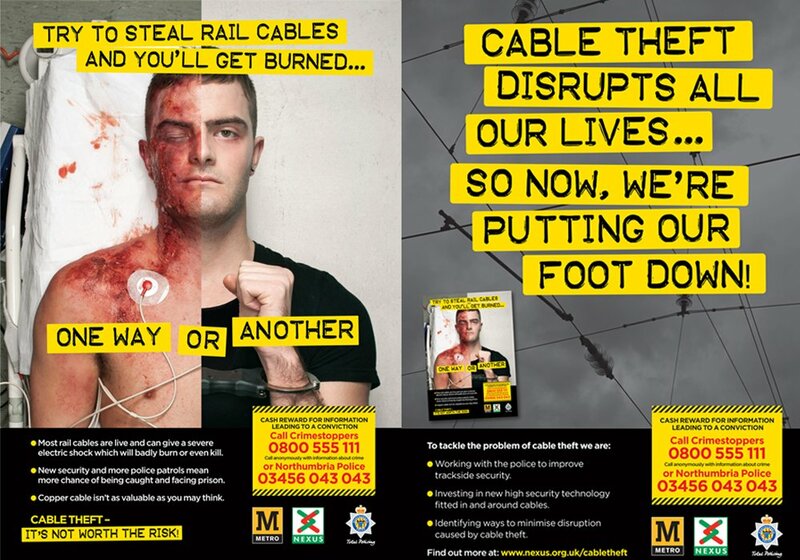 The campaign uses graphic images of a man with electric burns to highlight the safety message – as well as underlining that police are closing the net on cable thieves. Huw Lewis, Head of Communications at Nexus said: ”Guerilla originally won the project through a competitive pitch process with the clarity and strength of their creative and the hard-hitting message underpinning it. We were impressed how well they understood what we wanted from the campaign – which is to ram home the double danger of stealing metal from the rail network. The key messages of the campaign are that live cables on the railways have the potential to kill or cause serious injuries and that police patrols have been stepped up, making it even more likely that offenders will be caught in the act. The posters are still being displayed at prominent locations next to Metro tracks across Tyneside. The campaign won PR Campaign of the year at the 2012 UK Business Rail Awards and Won Gold at CIPR North East for Nexus.